Today’s kitchen, the center of family activity, wins hands-down as the modern home’s busiest room. Lighting requirements depend on the size and complexity of the kitchen space. While the kitchen is primarily a work area, it may also be used for dining or as a gathering place for family and friends. Small kitchens may require only a central ceiling fixture and task lighting tucked under a cabinet. More elaborate kitchens will demand a blend of general, task and accent lighting. Recessed lighting is best placed around the perimeter of the room and approximately 30" away from the wall. Chandeliers can be used in addition to other lighting in the space. 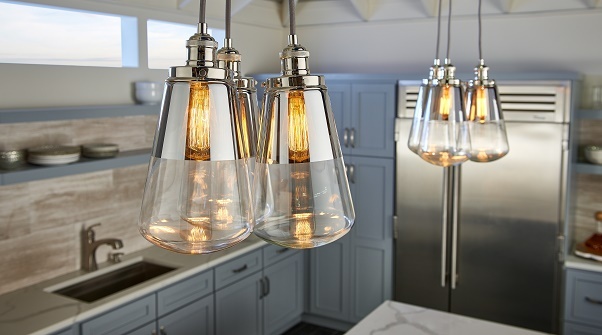 In the kitchen, it is best to use chandeliers with semi-transparent glass shades instead of fabric shades because the glass is much easier to clean. 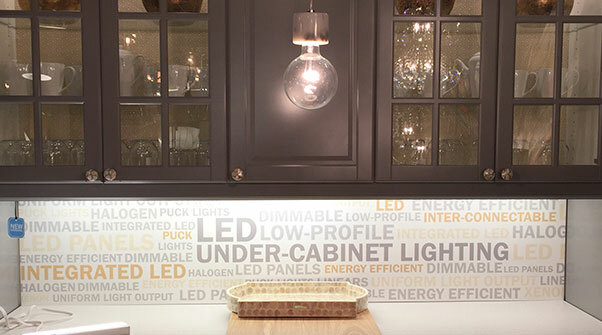 Undercabinet lighting will quickly and easily illuminate your countertops. Place undercabinet fixtures at the front of your cabinet not against the wall so the light will be distributed evenly over the area below. Also, consider putting your undercabinet lighting on a dimmer separate from other lighting in your kitchen. Island counters and breakfast bars demand a combination of task and general lighting. A very good solution is to add a group of miniature pendants. Mount each pendant so that the bottom of the shade is approximately 66" above the floor so it is possible to look across the room below the pendants. If the shades are not very deep and there is seating at the kitchen island or peninsula, install the pendants a few inches lower (60" above the floor). 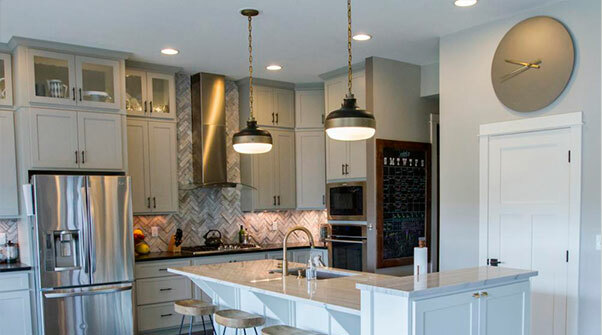 In general, you should install one pendant for every two feet of counter space and try to use an odd number of pendants to create better balance. Thin, narrow pendants, however, might look more pleasing with the addition of one or two extra fixtures. Lighting over the kitchen table is multipurpose used for dining, homework, hobbies or family business. 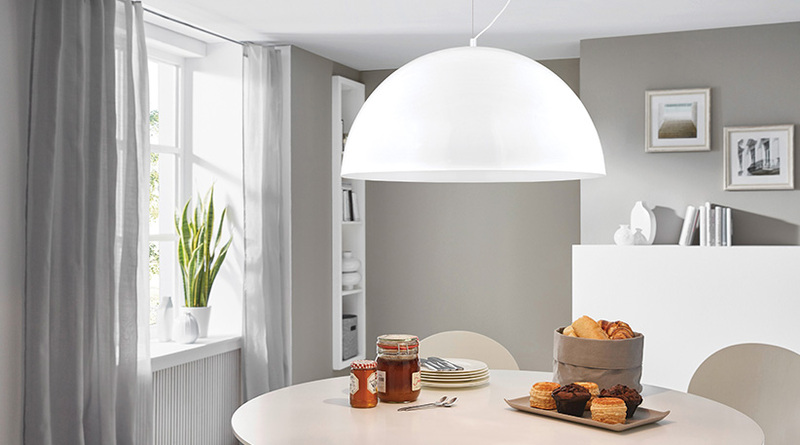 A decorative pendant will provide sufficient task lighting while also adding a touch of style and personality to your space. Mount pendant fixtures 30" above the table top. If your table is round, the fixture should ideally be 12" narrower than the diameter of the table. 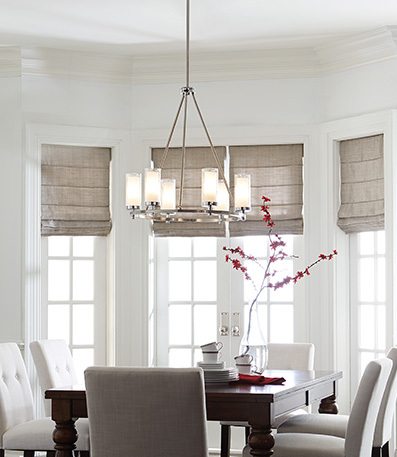 For square and rectangular tables, choose a fixture that is 12" narrower than the smallest side.